Choosing the right Investment Advisor is an important decision. In order to better serve you, we implement a 5 Step new client strategy to efficiently streamline your transition to Ferneau Asset Management. We are confident you will find value in our process. Step 1: Initial meeting to review your current financial situation, investment goals, expectations & risk tolerance. 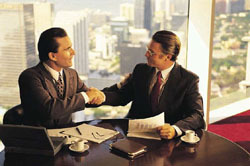 We discuss the investment opportunities & strategies available to you & answer all of your questions. Step 2: Thorough review of your overall financial profile. We then construct a well diversified financial plan designed to help you meet your investment goals. Step 3: Follow up meeting to review & discuss our recommendations. Before moving forward in the process, we mutually agree on an investment strategy that meets both your short & long term investment goals. Step 4: We implement our plan. Step 5: Quarterly, semi annual or annual meetings depending on individual client needs. We work directly with you, as a team, to ensure our plan stays in line with your investment goals & objectives . We look forward to helping you plan your financial future. Due to various state registration requirements concerning the dissemination of information regarding investment and insurance products and services, we are currently required to limit access of this website to individuals residing in states where we are currently registered. We are currently licensed to sell securities in AL, CA, CO, FL, KS, NE, NC, NH, NJ, and WA. Securites offered through Berthel Fisher & Company Financial Services, Inc. (BFCFS). Member FINRA/SIPC. Ferneau Asset Management is independent of BFCFS. Investment Advisory services offered through BFC Planning, Inc. Also: Ferneau Asset Management is independent of BFCFS and BFC Planning, Inc.